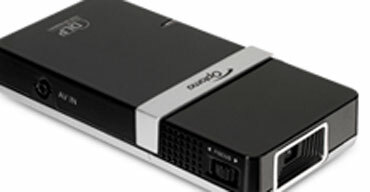 Are Pico Projectors Ready for Higher Ed? One constant about technology is that its evolution is characterized by greater capabilities in smaller form factors. "Smaller, faster, better." A large screen monitor used to look adequate, but the large screen meant it occupied a few feet, or more, from front to back. Today's monitors are higher resolution while extending only a few inches from the wall. We all know how the power of room-sized computers was reduced to notebook computer dimensions. And front projectors? Until this decade, most projectors used the same cathode ray tubes as TVs. They were massive and heavy. Then LCD (liquid crystal display) and DLP (Texas Instruments' digital light processing) changed the game, and now front projectors suitable for the classroom or lecture hall are brighter, with higher resolution, and can be as thin as notebook computers. But wait, there's more! A whole new category of projectors has recently emerged: the pico projector--the smallest category of front projection in existence. Some of the devices are so small they fit in the palm of your hand. Others are so small they will actually reside inside laptop computers or even mobile devices. The tiny form factor will be tempting to instructors, who will be able to load content at home or in their office, then carry these little gadgets in briefcases, purses, or even pockets to class. They will be even more attractive to visiting professors for the same reasons, and one could see the uses in virtually any department on campus. But are they suitable for course instruction in higher education? Not yet. "Certainly, picos will not replace the lecture projector," said Chris Chinnock, president of display industry research firm Insight Media, "but you could think of them as accessories for use by students in their dorm room." To understand why they aren't yet ready for class, one must look at the usual features by which a projector is measured. The projected image size from pico projectors is becoming less of a constraint, with many manufacturers claiming sizes of 50 inches measured diagonally, and, in the case of Microvision, even up to 100 inches. Contrast ratio is also quite adequate. Optoma's PK-101 packs a 1,000:1 contrast ratio, for example. The number is typical of many of the smaller portables. Microvision's SHOW, though, bumps that up to 5,000:1. Pricing is one of the most attractive features of pico projectors, with most coming in below $1,000 and many under $600. The Swivel by WowWee Projectors is a pico that plugs into an iPod or iPhone. The Swivel is priced at a low $299. Resolution is where it begins to get fuzzy in terms of comparing pico projectors. It is often difficult to find that specification even listed on product Web sites, mostly because it is rarely something about which pico manufacturers can brag. The BUGprojector from Bug Labs will be specified at native resolution of 480 x 320 when it ships. Syba's RC-VIS62002 projector is specified at a higher 640 x 480 resolution, but something to consider: It specifies it's for images up to 25 inches, leaving it very limited in how it can be used. The SHOW pico from Microvision is specified at WVGA (848 x 480)--DVD quality. 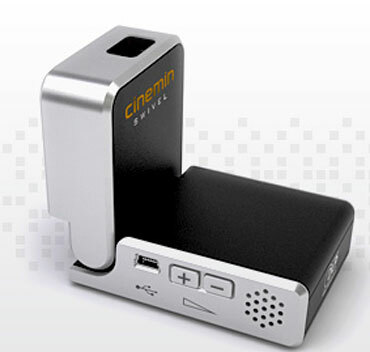 Then there is a company called Forever Plus that claims it will have a pico projector with a 720p full-HD resolution. So, when it comes to resolution, no pico on the market has the quality you'll want for the classroom. But they are getting there. Here's a sampling of pico projectors on the market now or soon to debut. Brightness is also where most pico projectors fall down when compared with other projectors. Most classroom or lecture projectors are going to be specified near 2,500 lumens of brightness. Pico projectors, if you can even find that spec listed, deliver fractions of that brightness and will typically measure in the double digits. AAXA's P1 pico projector is specified at 12 lumens, for example, and Syba's RC-VIS62002 projector delivers 10. Beambox, however, has several models specified at 30, and no doubt this year the market will see higher brightness ratings, since this spec is the biggest hurdle facing pico manufacturers. Does this mean pico projectors have no place in higher education? Not at all. Insight Media's Chris Chinnock compared pico projectors to other "must haves" in a student's education equipment list. "Notebooks became mandatory, and every student seems to have an iPod," he said, "so it is conceivable that picos could become the new rage on campus. Will this happen? Certainly if Apple is behind it the prospects are vastly improved." Chinnock said while he has no direct knowledge of Apple doing anything specific with pico projectors, he bets Apple is monitoring and perhaps prototyping. Already some pico projectors connect to the iPhone and iPod Touch. Some can connect to digital video cameras to bring movies from the camera to the screen. Then you have the ones that are, or will be, built right into notebook computers, PDAs, and cell phones. Meanwhile, stand-alone pico projectors are quite suited for specific applications in higher education. As Chinnock mentioned, use in the dorm room both for work and play is likely. One can also easily see the advantages of pico projectors within student study groups, in tutoring, and for reviews of assignments in progress. Will pico projectors ever be powerful enough for instruction? Based on the way technology evolves, yes. Soon? Possibly. It has been a long time since a new category broke into the audiovisual market. You can expect manufacturers to play a fast game of specification leap-frog this year and next in order to stay ahead in market share and sales.